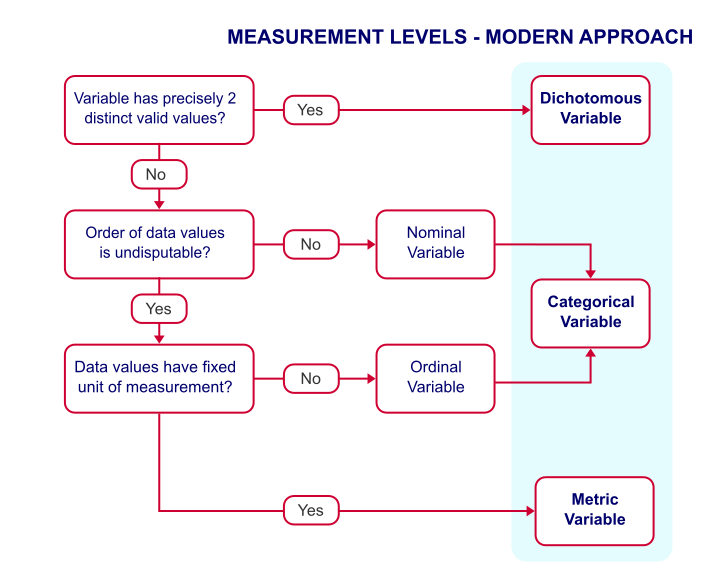 Measurement Levels – What and Why? You are here: Home Basics SPSS Essential Basics Measurement Levels – What and Why? The “higher” the measurement level, the more information a variable holds. The simple flowchart below shows how to classify a variable. Let's now take a closer look at what these variable types really mean with some examples. So what's the correct order for these countries? Well, we could sort them alphabetically, according to their sizes or to numbers of inhabitants. Different orders make sense for a list of countries. In short, countries don't have an undisputable order and therefore “country” is a nominal variable. Now, countries may be represented by numbers (1 = Netherlands, 2 = Belgium and so on) in SPSS or some other data format. These numbers do have an undisputable order. But country is still a nominal variable because what's represented by these numbers -countries- does not have an undisputable order. In a similar vein, ZIP codes -representing geographical areas which don't have a clear order- are nominal as well. But prices in dollars -representing amounts of money- obviously do have an undisputable order and hence are not nominal. Some may argue that Bad = 1 point, Neutral = 2 points and Good = 3 points. But that's just a wild guess. Perhaps our respondents feel Neutral represents 1.5 or 2.5 points. This is illustrated by the figure below. Intervals between answer categories are unknown for ordinal variables. We've no way to prove which scenario is true because just “points” are not a fixed unit of measurement. And since we don't know if Neutral represents 1.5, 2 or 2.5 points, calculations on ordinal variables are not meaningful. Less strictly though, calculations on ordinal variables are quite common under the Assumption of Equal Intervals. is ordinal. Euros are a fixed unit of measurement but the answers are income categories, not numbers of Euros. but zero does not mean “nothing”. One of the rare examples is “in which year did it happen?” Ignoring leap days, years are a fixed unit of measurement for time. However, the year zero doesn't mean “nothing” with regard to time. As a consequence, multiplication is not meaningful for interval variables. The year 2000 isn't “twice as late” as the year 1000. The same goes for temperature in degrees Celsius: zero degrees is not “nothing” with regard to temparature. Therefore, 100 degrees is not twice as hot as 50 degrees. This argument could, however, be made for temperature in Kelvin. We should add that these are the only 2 examples of interval variables we could think of. Interval variables are always analyzed similarly to ratio variables -which we'll turn to next. 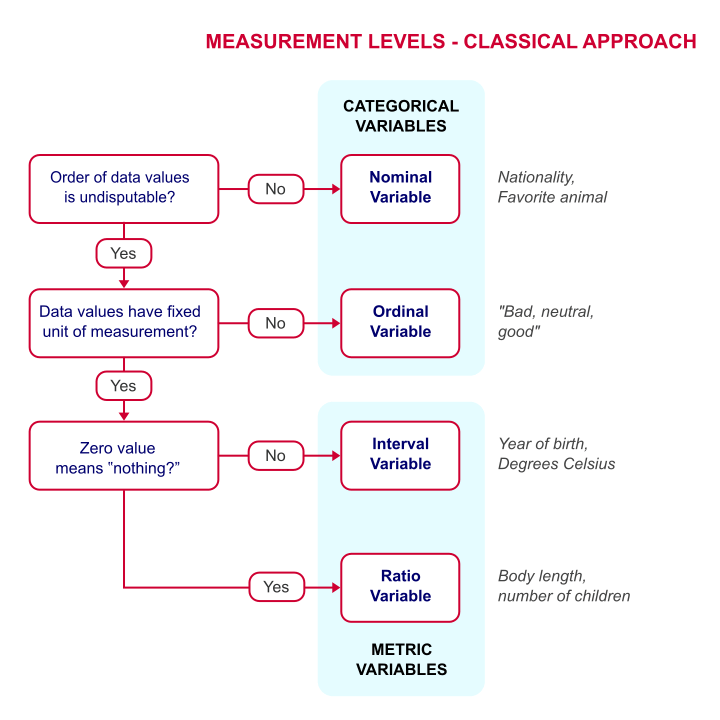 But distinguishing these as separate measurement levels -all textbooks still do- is pointless. and zero really means “nothing.” An example is weight in kilos. A kilo is a fixed unit of measurement because it always represents the exact same weight. Also, zero kilos corresponds to “nothing” with regard to weight. As a consequence, multiplication is meaningful for ratio variables. In fact, we don't need more than a kitchen scale to prove that 2 times 1 kilo really is the same amount of weight as 1 time 2 kilos. Some text books mention an “absolute zero point”. We rather avoid this phrasing because ratio variables may hold negative values; the balance of my bank account may be negative but is has a fixed unit of measurement -Euros in my case- and zero means “nothing”. categorical variables (nominal and ordinal) are sometimes treated similarly and sometimes not. Because of these reasons, we think the classification below is much more helpful. This classification distinguishes 3 main categories which we'll briefly discuss. logistic regression predicts a dichotomous outcome variable. calculations are not meaningful. Therefore, nominal and ordinal variables are categorical variables. They contain (usually few) answer categories. Because calculations are not meaningful, categorical variables merely define groups. We therefore analyze them with frequency distributions and bar charts. we use descriptive statistics for analyzing metric variables. Next, we could visualize the association with a stacked bar chart. Or we may test if the association is statistically significant by running a chi-square independence test on our contingency table. Or perhaps we'd like to know if a categorical variable and a metric variable are associated. The categorical variable defines groups. Within those groups, we'll inspect descriptive statistics over our metric variable. We thus arrive at the table as shown below. We could visualize the means as a bar chart for means by category. Or we could test if the population means differ by category with ANOVA. So now we see how measurement levels help us choose the right analyses. For a more complete overview of analyses by measurement level, see SPSS Data Analysis - Basic Roadmap. Previous tutorial: What is a Frequency Distribution? Thanks! It was very helpful!!! I definitely will read through all the lessons! The steps illustrated here can make even a nursery kid to understand. Very helpful, but a bit heavy for a newbie, with a lot of linkouts. But the info is presented nicely.